Those familiar with Full Moon and their Puppet Master series will be happy to learn that Craig Zahler's (Bone Tomahawk) Puppet Master: The Littlest Reich is reportedly as irreverant and politically incorrect, gory and FUN as one would expect it to be. We're a bit late on this but there is a trailer and now a soundtrack sampler out for the film. The soundtrack is composed by legendary Italian composer Fabio Frizzi. Recently divorced and reeling, Edgar returns to his childhood home to regroup his life. When Edgar finds a nefarious looking puppet in his deceased brother’s room, he decides to sell the doll for some quick cash. Girl-next-door Ashley and and comic book pal Markowitz join Edgar for a doomed road trip to an auction at a convention celebrating the 30th Anniversary of the infamous Toulon Murders. All hell breaks loose when a strange force animates the puppets at the convention, setting them on a bloody killing spree that’s motivated by an evil as old as time. 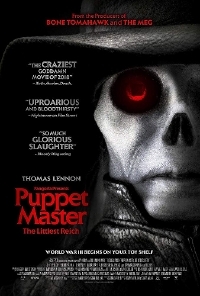 Puppet Master: The Littlest Reich is in theaters now and the OST is available through Lakeshore Records. It hits Blu-ray on Sept. 25, 2018.